The null genotype of GSTM1 have been implicated in gastric cancer risk, but numerous individual studies showed mixed, or even conflicting results. Thus, a meta-analysis was performed. We identified 54 individual studies involving 9,322 cases and 15,118 controls through computer-based searches of PubMed, Embase, and Cochrane Library. It was found that the null genotype of GSTM1 was associated with an increased gastric cancer risk (OR = 1.207, 95% CI: 1.106-1.317, P < 0.001), under the random-effects model (I2 : 49.9%, PQ <0.001). From stratification analyses for ethnicity, alcohol drinking, Helicobacter pylori infection, an effect modification of gastric cancer risk was found in the subgroups of ethnicity, smoking status, Helicobacter pylori infection, whereas null result was found in the subgroups of alcohol drinking. We also undertook gene-gene interaction analysis between GSTM1 and GSTT1 genes for gastric cancer risk, and the results indicated that the dual null genotypes of GSTM1 and GSTT1 might elevate the risk of gastric cancer (OR = 1.505, 95% CI: 1.165-1.944, P = 002). This meta-analysis suggests that the null genotype of GSTM1 may be a important genetic risk factor for gastric cancer development. The incidence and mortality of gastric cancer (GC) has been substantially falling over the last few decades in most parts of the world , however, gastric cancer was still the second most common cancer worldwide (989,600 new cancer cases) and also the second most common cause of cancer mortality (738,000 deaths) in 2008 . As a long, complicated and multi-factorial process, gastral carcinogenesis is still not fully understood. Several suspected environmental risk factors for the development of gastric cancer are dietary habits, including high consumption of salty food and low consumption of fresh fruits and vegetables, cigarette smoking, and alcohol consumption, as well as Helicobacter pylori infection -. In addition to these, genetic factors also play an important role in gastric cancer aetiology, demonstrated by the fact that a large proportion of individuals with the known environmental risk factors never develop gastric cancer while many gastric cancer cases develop among individuals without these known environmental risk factors. Therefore, investigation of the responsible genetic polymorphism which may increase host susceptibility to gastric cancer is equally important to the identification of environmental risks for a better understanding of interindividual variation in response to carcinogen exposures and cancer susceptibility ,. Glutathione-s-transferases (GSTs) are one of the most important supergene family of phase II isoenzymes known to catalyze the detoxification of reactive electrophilic compounds, such as carcinogens, therapeutic drugs, environmental toxins, and products of oxidative stress, chiefly by conjugation with soluble glutathione . In addition, GSTs are able to modulate the induction of other enzymes and proteins which are important in cellular functions, such as DNA repair, and are therefore important in maintaining genomic integrity . In this respect, the GST enzymes could potentially play a central role in carcinogenesis. In humans, GSTs are divided by electrophoresis into at least four major classes, namely Alpha, Mu, Pi, Theta. GSTM1 and GSTT1 are the genes that encoding the Mu class and the Theta class of GSTs, respectively. The GSTM1 gene is located on chromosome 1p13.3 and contains 10 exons, and the GSTT1 gene is mapped to chromosome 22q11.23 and contains six exons. The common variants of GSTM1 and GSTT1 genes is the homozygous deletion (null genotype), which has been reported to causes the loss of enzymic activity and might higher the risk of various cancers. A recent meta-analysis  has suggested that an increase in gastric cancer risk was associated with GSTT1 deficiency. However, a review of genetic susceptibility and gastric cancer risk reported that the results of case–control studies detailing associations between the GSTM1 gene and gastric cancer risk are controversial . Since Strange et al. firstly published the study showing an association between GSTM1 null genotype and a possible excess risk of developing gastric cancer in 1991 . Subsequently, numerous researchers have consecutively reported on the same issue in various populations, but with mixed, or even conflicting results -. One of major problems with the published studies is that many of them included relatively small sample size. Furthermore, because the GSTM1 null genotype is regarded as a potential contributor to gastric cancer risk by influencing detoxification of activated environmental carcinogens and by interaction with unfavourable GSTT1 polymorphism, the possible modifying effects of GSTM1 status on the relationship between smoking status, alcohol drinking,Helicobacter pylori infection,GSTT1 polymorphism and gastric cancer risk is of great interest, even though not often investigated. To obtain more precise estimate for the association between GSTM1 polymorphism and gastric cancer risk, we conducted a quantitative meta-analysis of all available studies published until August 15, 2014. In addition, we performed subgroup analysis stratified by smoking status, alcohol drinking and Helicobacter pylori infection to explore the possible effects of the interactions between GSTM1 genotype and above environmental risk factors, and gene–gene interaction analysis between GSTM1 and GSTT1 genotype with respect to gastric cancer risk. 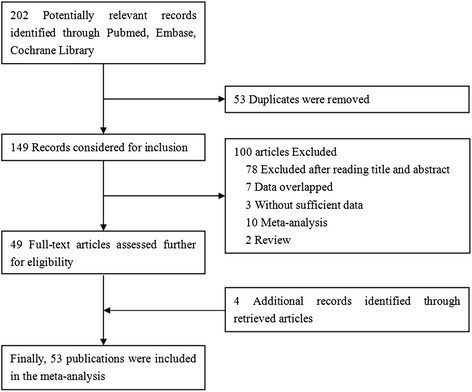 We conducted a comprehensive database searching for PubMed, Embase, and Cochrane Library through August 15, 2014 for relevant studies that estimated the association between GSTM1 polymorphism and risk of gastric cancer using the following search terms: (1) gastric cancer, gastric carcinoma, gastric adenocarcinoma, stomach neoplasm, stomach cancer, GC; (2) Glutathione-s-transferases, GSTs, GST mu, GSTM, GSTM1, GST1; (3) polymorphism, SNP, variant, mutation, genetic polymorphism. The scope of the computerized literature search was also expanded on the basis of the reference lists of eligible articles. There was no restriction on language. We first performed an initial screening of titles or abstracts to find potentially appropriate articles. A second screening was based on full-text review to identify those containing useful data on the topic of interest for inclusion in the meta-analysis. Studies were considered eligible if they met the following criteria: (1) publications assessed the relationship between GSTM1 status and gastric cancer; (2) used a cohort or case–control studies design; (3) had an appropriate description of GSTM1 status in cases and controls; (4) repored an odds ratio (OR) with 95% confidence interval (CI) or other available data for calculating OR (95% CI). Furthermore, when data from a single unique study population was republished by the same author or written in English, only the most recent article or largest report was considered. When a study reported the results on different subpopulations, we treated them as separate studies in the meta-analysis. Each article was extracted by two independent researchers (X Lao and Q Peng), who are blinded with respect to the authors, institutions and journals, using a structured sheet and entering into a database. The following data were extracted: first author, year of publication, country, ethnicity of study populations (categorized as Asian, Caucasian, and Negroid), number of cases and controls, gastric cancer diagnosis method, source of control selection, matching criteria between cases and controls, genotyping method, exposures of smoking, alcohol consumption, Helicobacter pylori infection or GSTT1 genetic polymorphism in cases and controls, GSTM1 status in cases and controls. If there were any discrepancy between these two investigators, a discussion would be carried out to make an ultimate decision through the third investigator (S Li). The strength of the association between the GSTM1 polymorphism and gastric cancer risk was measured by the odds ratio (OR) with 95% confidence interval (CI). The significance of the pooled OR was determined by Z test and a P value of less than 0.05 was considered significant. Then, we examined the associations between null genotype of GSTM1 and gasreic cancer risk on the genetic comparison model (null genotype vs. present genotype). In carrying out the meta-analysis, two models for dichotomous outcomes were conducted: the random-effects model and the fixed-effects model. The random-effects model, using the DerSimonian-Laird method , was conducted to pool the results when heterogeneity between studies existed on the basis of Q-test P-value which was less than 0.1 . The fixed-effects model, using the Mantel-Haenszel method , was utilized to pool the results if the Q-test P value was more than 0.1. Besides, the I2 statistic was calculated to assess the between-study heterogeneity, and heterogeneity was deemed as apparent when the I2 statistic value was greater than 50%. Furthermore, several subgroup meta-analyses were performed in an attempt to assessed the association between the GSTM1 null genotype and gastric cancer risk based on the ethnicity, smoking status, alcohol drinking and Helicobacter pylori infection. For these purposes, we stratified subjects (both GSTM1 present and null genotypes) according to ethnicity (categorized as Asians, Caucasians and Negroids ), smoking status (non/ever smokers); alcohol drinking (non/ever drinkers); Helicobacter pylori infection (negative/positive infection). In order to evaluate the presence of a biological interaction between GSTM1 and GSTT1 polymorphisms, additional gene–gene interaction analysis were performed by using the individuals with present genotypes for both genes as reference groups, as suggested by Botto and Khoury . To validate the credibility of outcomes in this meta-analysis, a sensitivity analysis was performed by sequential omission of individual studies. 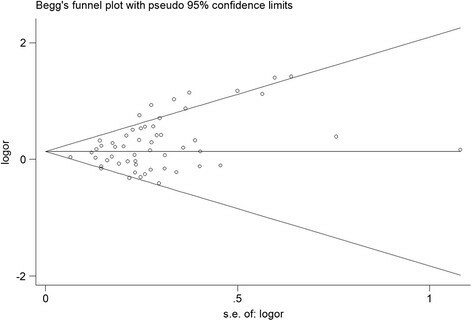 Publication bias was investigated using a funnel plot, in which the standard error of logor of each study was plotted against its logor. An asymmetric plot suggested the existence of possible publication bias. In addition, funnel-plot asymmetry was formally assessed by the method of Egger’s linear regression test . If publication bias existed, the Duval and Tweedie non-parametric “trim and fill” method was used to adjust for it . All analyses were performed using Stata software, version 12.0 (Stata Corp, College Station, TX). All P values were two-sided. To ensure the reliability and the accuracy of the results, two authors (Lao X and Peng Q) entered the data into the statistical software programs independently with the same results. After comprehensive searching, a total of 202 articles were retrieved, but only 49 full-text publications -,-,- which catered to the inclusion criteria were finally included in our meta-analysis. Additonal four studies ,,, were identified by reviewing the bibliographies of the retrieved articles (Figure 1). Besides, because there was a study  containing two different ethnic populations (Caucasians and Negroids), we treat it as two individual case–control studies. Thus, in our meta-analysis we initially included a total of 54 studies which assessed the associations between GSTM1 polymorphism and gastric cancer. The 54 studies were published from 1991 to 2013 with 35 were carried out in Asian countries, 11 in Europe countries, and eight in America. Of these 54 studies, 51 were case–control design, while the other three were nested case–control design from cohort. The number of cases in the included studies for GSTM1 deletion varied from 5 to 1225 patients. There were 14 studies focused on the joint effect of GSTM1 null genotype and smoking status on gastric cancer risk, four investigated the joint effect of GSTM1 null genotype and alcohol drinking, and seven eveluated the joint effect of GSTM1 null genotype and Helicobacter pylori infection. 15 studies investigated the gene-gene interaction between GSTM1 and GSTT1 polymorphisms in the association with gastric cancer risk. Table 1 presents a brief description of these 54 studies. Flowchart of the selection of studies for inclusion in the meta-analysis. GC, gastric cancer; NA: relative data not available in original studies; PCR: Polymerase chain reaction; PCR–RFLP: Polymerase chain reaction-restriction fragment length polymorphism; RT-PCR: Real-Time PCR; PCR-CTPP: Polymerase chain reaction with confronting two -pair primers. Table 2 lists the main results of this meta-analysis. *The genetic comparison model for GSTM1–GSTT1interaction analysis is Dual null genotype vs. Non-null genotype. # M, model of meta-analysis; R, random-effects model; F, fixed-effects model. ※ PQ: P values of Q-test for heterogeneity test. ¶Values could not be calculated out. The results of pooling all studies showed that the null genotype of GSTM1 was associated with an increased gastric cancer risk (OR = 1.207, 95% CI: 1.106-1.317, P < 0.001), using the random-effects model (I2 : 49.9%, PQ < 0.001) (Figure 2). As shown in Tables 2, specific data were stratified, on the basis of ethnicity, into three subgroups: Aians, Caucasians and Negroids. Statistically significant findings were found in Asians and Caucasians but not in Negroids. The pooled OR were 1.264 (95% CI: 1.164-1.422, P < 0.001, P for heterogeneity = 0.002) in Aians, 1.154 (95% CI: 1.008-1.321, P < 0.037, P for heterogeneity = 0.001) in Caucasians, and 1.182 (95% CI: 0.142-9.827, P < 0.887) in Negroids, respectively. Forest plots for the null genotype of GSTM1 and gastric cancer risk of overall populations using a random-effects model (null genotype vs. present genotype). The data were also stratified, in accordance with the smoking status, into non-smokers and ever-smokers subgroups. Statistically significant findings between the null genotype of GSTM1 and gastric cancer risk was found in both non-smokers (OR = 1.370, 95% CI: 1.043-1.800, P < 0.024, P for heterogeneity = 0.028) and ever-smokers subgroups (OR = 1.558, 95% CI: 1.111-2.183, P < 0.010, P for heterogeneity < 0.001), respectively. The data were additionally stratified, in line with alcohol driking, into the subgroup of non-drinkers and ever-drinkers. However, null results were noted in both non-drinkers (OR = 0.872, 95% CI: 0.623-1.220, P = 0.425, P for heterogeneity = 0.757) and ever-drinkers (OR = 1.112, 95% CI: 0.771-1.602, P = 0.570, P for heterogeneity = 0.905). The data were further stratified, in the light of Helicobacter pylori infection, into Helicobacter pylori negative and Helicobacter pylori positive subgroups. Statistically significant findings could be found only in Helicobacter pylori positive subgroup (OR = 1.595, 95% CI: 1.104-2.304, P < 0.013 P for heterogeneity = 0.076), but not for Helicobacter pylori negative subgroup (OR = 0.869, 95% CI: 0.654-1.156, P < 0.334, P for heterogeneity = 0.373). Table 3 shows the OR and 95% CI of GSTM1 and GSTT1 combined genotypes in gastric cancer cases and controls from 15 studies. We designated the present genotype individuals for both GSTM1 and GSTT1 genes as reference groups. There was an interaction that only observed for individuals with combined deletion mutations of GSTT1 and GSTM1 genes for gastric cancer risk (OR = 1.505, 95% CI: 1.165-1.944, P = 002). This shows that the null genotype of GSTM1 might increase gastric cancer risk associated with the GSTT1 null genotype. A sensitivity analysis was performed by the sequential omission of individual studies. The significance of the pooled OR in both the overall analysis and subgroup analysis were not influenced excessively by omitting any single study (data were not shown). Begg’s funnel plot and Egger’s test were performed to access the publication bias of literatures. 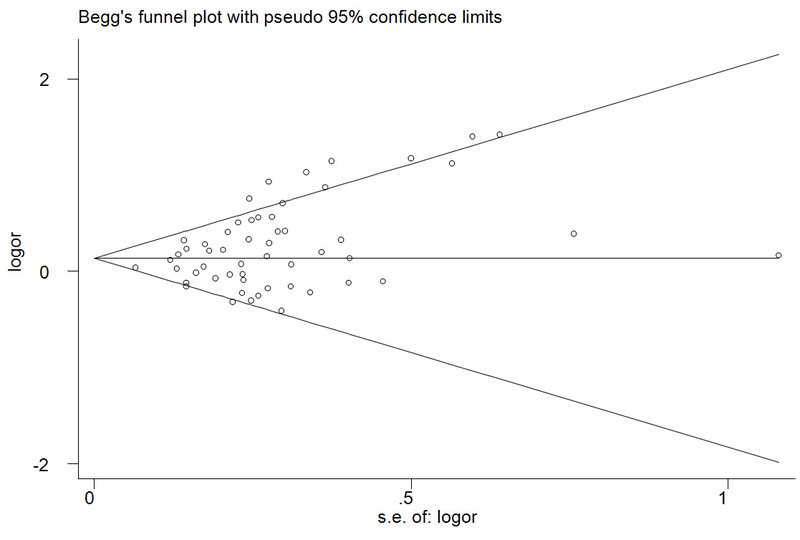 As shown in Figure 3, the shape of the funnel plots seemed asymmetrical suggesting the presence of publication bias. Then, the Egger’s test was adopted to provide statistical evidence of funnel plot asymmetry. 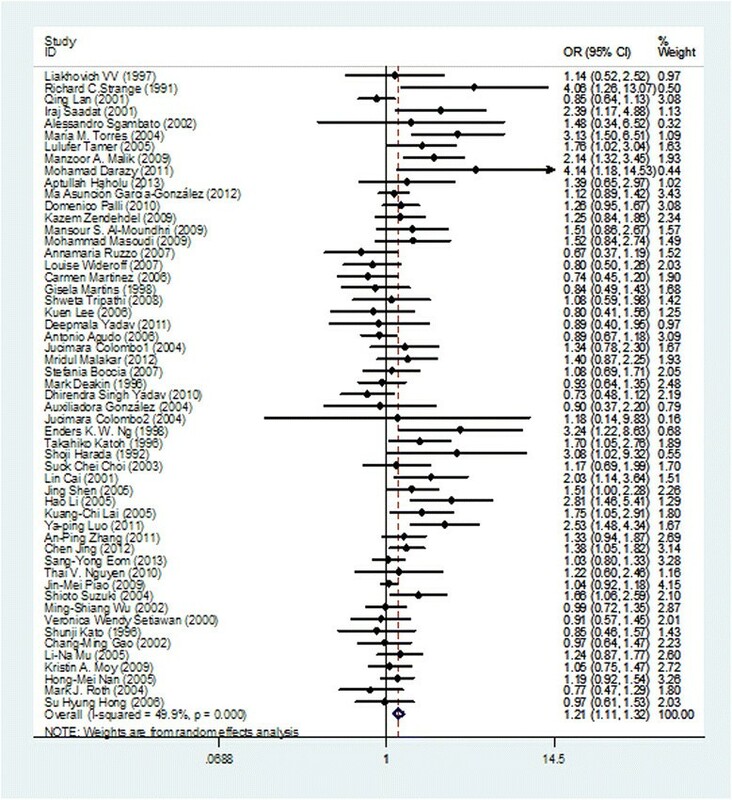 As expected, the results have shown that publication bias was evident in this meta-analysis (P = 0.004). Hence, the non-parametric “trim and fill” method , suggested by the Duval and Tweedie, was used to adjust for it. Meta-analysis with and without “trim and fill” method did not draw different conclusion (data not shown), indicating that our results were statistically robust. Begg’s funnel plots for publication bias of the null genotype of GSTM1 and gastric cancer risk in the overall populations (null genotype vs. present genotype). Each point represents a separate study for the indicated association. The present and null genotype of GSTM1 is one of the most widely studied metabolic gene polymorphisms as susceptibility factor for gastric cancer. In 2005, La Torre et al. firstly performed a meta-analysis about the association between GSTM1 genetic polymorphism and gastric cancer susceptibility, and the results suggested that GSTM1 deficiency possiblely has no effect on gastric cancer risk, but may modulate tobacco-related carcinogenesis of gastric cancer. Since then, additional expanding body of literatures assessing such association were conducted by Chen et al. and Zhu et al. . Both of them found that a excess gastric cancer risk was probably associated with GSTM1 null genotype in Asians, but not in Caucasians. Besides, Chen et al. revealed that smoking, Helicobacter pylori infection status did not modify the association between GSTM1 null genotype and gastric cancer risk. However, these previous meta-analysis did not cover all eligible studies published in Pubmed and even contain the overlapped data, which made their conclusions doubtable. What’s more, 12 new case–control studies - have been published since 2010. Hence, to derive the most comprehensive assessment of the associations between the GSTM1 polymorphism and gastric cancer risk, we undertook an updated meta-analysis of all available studies. The main finding of this meta-analysis of 54 studies involving 9,322 cases and 15,118 controls is that individuals of GSTM1 null genotype appear to have a significant increased risk of gastric cancer. Large ethnic differences for the frequency of homozygous deletion in GSTM1 have been observed. Frequencies of homozygous GSTM1 null genotype in Japanese, Chinese, Indians (Asia), Caucasians and Africans were 48%-51%, 35%-63%, 33%-36%, 50%, 22%-35%, respectively . For the subgroup meta-analyses of ethnicity, which categorized as Asians, Caucasians and Negroids, the results showed that the GSTM1 null phenotype predisposes to gastric cancer in both Asian and Caucasian populations, but not in Negroids. For Caucasians, what is notable that the association between GSTM1 null status and gastric cancer risk simply reaches a slightly statistically significant level. Since the Caucasian reports in the subgroup analysis include a mixture of populations from very distant countries, the result must be interpreted with caution. For Negroids, it might seems that the low prevalence of this viriant and the low number of samples would make it difficult to detect an association between GSTM1 null phenotype and gastric cancer risk with only 13 cases and 15 controls. It may also be that other gastric cancer risk factors, such as prevalence of Helicobacter pylori infection, lifestyle, diet, or other environmental risk factors for which ethnic groups vary, may be responsible for the different associations observed in this meta-analysis. In our meta-analysis, we proceeded the subgroup meta-analysis of pooling data from the cases and the controls on smoking status, and the suggestion of an increase risk of gastric cancer was found in not only non-smokers but also ever-smokers. Interestingly, both the OR and the upper and lower limits of corresponding 95% CI in ever-smokers are much higher than non-smokers. Smoking is an important established risk factor for gastric cancer that accouts for about 50 % increase in gastric cancer risk . Jarebinski et al. , in 1992 first reported that there is a weak association between smoking and gastric cancer. Then, Ladeiras-Lopes et al. in 2008 conducted a meta-analysis including only prospective studies to estimate the relationship between smoking and gastric cancer, and concluded that smoking is the most important behavioral risk factor for gastric cancer, especially for male smokers. Nevertheless, the mechanism by which tobacco smoke facilitates gastric cancer development is not well recognised. Processed tobacco contains over 3,000 compounds including 30 carcinogens. The mainstream and sidestream smoke generated when tobacco in cigarettes is burnt contains more than 4,000 constituents including about 50 carcinogens (e.g. benzo(a)pyrene, styrene-7,8-oxide, transstibene oxide, epoxybutanes, ethylene oxide, halomethanes, and methyl bromide). Many of these compounds are firstly metabolized by phase I enzymes, and detoxified and converted to inactive metabolites by the phase II enzymes including GST family enzymes. Individuals who present inefficient phase II metabolism may accumulate more toxic intermediates when exposed to smoking, and thereby resulting in increasing their risk of developing cancers. GSTM1 is one of the major member of the GST family which are involved in detoxification of smoking-related carcinogens. Previous reports have showed that the null genotype of GSTM1 causes the loss of enzymic activity . So, we propose a hypothesis that smokers who present the GSTM1 null genotype are more susceptible to impairment by tobacco smoke, due to the low catalytic efficiency. Furthermore, we carried out the subgroup analysis on alcohol drinking to detect the possible effect of GSTM1 deficiency on gastric cancer risk. Alcohol drinking is supposed to be a risk factor of gastric cancer, due to the reactive oxygen species (ROSs). ROSs are produced during alcohol metabolism as a result of the generation of NADH from the conversion of ethanol to acetaldehyde by alcohol dehydrogenase, and may induce gastric mucosal oxidative injury ,. Despite the biological plausibility of alcohol drinking as a modulator of gastric cancer susceptibility, previously inconsistent results have appeared. In 1988, an International Agency for Research on Cancer (IARC) working group concluded that there was no evidence support that alcohol dringking was involved in the pathogenesis of gastric cancer . In 2007, the IARC working group reassessed the carcinogenesis of alcohol consumption and concluded that alcohol consumption might be associated with an increased gastric cancer risk, but confounding by smoking and dietary habits could not be ruled out . GSTM1 can detoxify many toxicological substrates, including ethanol, to become inactive products. Therefore, the effect of the interactions between GSTM1 polymorphism and alcohol drinking on gastric cancer risk should be noted. Unfortunately, there was no association between GSTM1 null genotype and increased gastric cancer risk was found in non-drinkers or ever drinkers in the meta-analysis. However, only four studies with insufficient statistic power concerning drinking status were included in the present mata-analysis, with possible biases existed. Further investigations on the effect of the interactions of GSTM1 null genotpe and alcohol drinking on gastric cancer risk are required to address this controversy. We also examined the association between Helicobacter pylori infection and the risk of gastric cancer. Helicobacter pylori is a spiral Gram-negative bacterium that colonizes the stomach, and which has been implicated as a Class 1 human carcinogen for gastric cancer . The promulgation was based on several scrupulously conducted case–control studies in which chronic Helicobacter pylori infection was shown to eveluate the risk of gastric cancer from 2.8-to 6-fold ,. There is now evidence that approximately 25–50% of the world’s population is infected by the microorganism, and that up to 85 % of noncardia gastric cancers are Helicobacter pylori related . However, it remains obscure why quite a few individuals infected do not develop the malignancy, even in areas with a high prevalence of both Helicobacter pylori infection and gastric cancer. Ng EK et al. found that GSTM1 null genotype was more prevalent in gastric cancer cases with Helicobacter pylori infection than without the infection, and the result suggested that the absence of GST-mu function might have enhanced the susceptibility of these patients to the carcinogenic process initiated or facilitated by Helicobacter pylori. In our meta-analysis, there were six publications including a total of 1,007 cases and 1,487 controls examined the relationship between Helicobacter pylori infection and GSTM1 polymorphism for the risk of gastric cancer, and some risk excess was observed among Helicobacter pylori infection positive individuals compared with negative individuals by combining the data available from these six studies. However, these results should be interpreted with caution as the subset analysis involved a small number of patients and controls that may have affected the statistical analysis. If genetic susceptibility to gastric cancer is, in part, mediated through metabolic gene polymorphisms, it is possible that the combinations of certain genotypes may be more discriminating as risk factors for gastric cancer than a single locus genotype. Because GSTM1 and GSTT1 are involved in the detoxification of a variety of compounds, and their substrates often overlap, it is possible that individuals with a more defective genotype of these genes can be expected to at higher risk of cancers. A previous study has looked at the combination between GSTM1 and GSTT1 in gastric cancer and showed that a 95% significant increased risk of gastric cancer appeared for individuals with combined deletion mutations in GSTT1 and GSTM1 genes in comparison with individuals with both homozygous wild genotypes . Hence, we also investigate the possible interaction between GSTT1 and GSTM1 status and gastric cancer risk in this meta-analysis. Even though only 15 of 54 selected studies collected data on GSTT1 status, a statistically significant increased risk for gastric cancer was detected for individuals with combined deletion mutations in both GSTM1 and GSTT1 genes compared to those with wild genotypes by pooling the data from available studies. Several limitations of the study have to be acknowledged in interpreting the results. Firstly, the sample sizes for a majority of included studies were relatively small; source of controls were somewhat different from each other; the matching criteria for the cases and controls were also not strict. Thus, robust guarantee could hardly be made among all those eligible studies. Additionally, only published studies were included in our meta-analysis and a publication bias have occurred. Even though non-parametric “trim and fill” method was used to adjust for it and the result suggested that meta-analysis with and without “trim and fill” method did not draw different conclusion, if the unpublished studies are not included an overestimation of the GSTM1 null effect may inevitably appear. Finally, the subgroup meta-analyses considering interactions between GSTM1 null genotype and smoking status, alcohol drinking and Helicobacter pylori infection, as well as GSTT1 null genotype were performed by collecting data from a minority of included studies, so selection bias may have occurred in this meta-analysis. What’s more, more subgroup analyses performed on age, gender, histological types, and other factors (such as vegetable and fruit intakes, salt and salted preserved food intakes) would be better to investigate possible biases; however, we could not perform subgroup analyses on these factors owing to the limited available information in the primary literatur. This meta-analysis suggests that the null genotype of GSTM1 are associated with increased gastric cancer risk, and the subgroup meta-analysis on the basis of ethnicity showed that significant associations are found for Asians and Caucasians, but not for Negroids. In additon, the null genotype of GSTM1 may modulate the smoking-related and Helicobacter pylori-related carcinogenesis of gastric cancer, and that the combination of unfavourable GSTT1 polymorphism may result in an additional risk of gastric cancer. Future studies with large and carefully design are warranted to better understand such a association between GSTM1 null genotype and gastric cancer risk. We would like to thank to Dr. Cuiju Mo for her technical help with the literature search and Scribendi.com for its linguistic assistance during the preparation of this manuscript. X-JL and Q-LP was the main researcher for this study and took part in conceptualization, study screening, data extraction, writing of the manuscript. YL and SL were involved in software used, data analysis and final editing. XQ and Z-PC did to guide the statistical analysis and manuscript editing. J-QC planned the study, wrote the protocol, advised on all methodological issues and critically revised the manuscript. All authors approved the final version of this manuscript and agreed to be accountable for all aspects of the work.